Going on summer holiday with a new baby for the first time can be a daunting prospect, at best. Planning ahead is one way to ensure that things go as smoothly as possible, whether you are at home or abroad. Make the most of your holiday by having what you need, when you need it – it's worth all the hassle! Pushchair/buggy and/or sling. Take along a small pushchair, or borrow one if yours is massive. It can also be a good idea to have a sling or even a baby backpack, if your baby is a bit older. Baby toys. Don't just assume there will be enough to keep your baby occupied. You don't have to bring the entire contents of your nursery with you, but a few familiar toys will be appreciated, as well as teething rings and comfort items. Food preparation items. Take your own bibs spoons, bottles with you, as well as a bottle steriliser if needed – unless you ask in advance if one can be provided. Don't assume that baby food will be available if you travel outside the western world. Even in places such as Turkey, where baby food is for sale, it is prohibitively expensive, compared to the UK. Take your own brand of formula with you – in some countries you may need to purchase bottled water. If no highchair is provided, bring a small booster seat or have your baby sit in your lap while feeding. Changing items. Some countries might not have the nappies and wipes you are used to, so you may want to bring an adequate supply with you. If you travel in the UK, make sure you bring a changing mat and enough nappies, nappy rash cream etc while you're on the road. You can also purchase an inflatable baby bath to make bathing your baby easier while on the road, and take plenty of spare clothes – for you and the baby - as well as baby travel wash with you. Just in case. If your baby can only fall asleep for a nap in a specific bouncy chair, bringing it with you is a good idea. If he or she falls asleep listening to a specific wind-up toy, then chuck it in your suitcase as well. Your child will have enough unfamiliar things to get used to whilst travelling, so providing a sense of security away from home is important. Emergency items. An adequate supply of Calpol, a baby thermometer and a first aid kit with antiseptic creams, plasters etc. can make all the difference, especially if you are travelling in a remote place or abroad where finding normally easy-to-find items may be difficult. For long car journeys, it is worth investing in children's window shades, to keep the sun off baby's face. You might also need car sickness medicine, although usually small babies are immune from this nasty condition! Make sure your car seat is the right one for your child's age, and that it fits securely and comfortably. Kiddicare have a great range of child car seats. Choose a family-friendly hotel. If your baby is already active and crawling, make sure the hotel balcony, for example, is child-friendly – or you may have the doors locked the entire time. Some hotels don't mind children eating in the restaurant in the evenings, others do. Ask before you book. 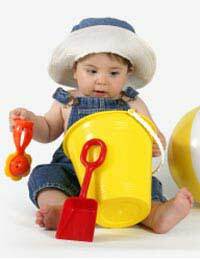 Take holiday-specific baby items, as well as the ones listed above. That means swim nappies, water wings, a sunhat, suncream and even a pop-up tent to protect baby from the sun's harmful rays if you are going to the beach, and long-sleeved clothes if you are going somewhere hilly and chilly. Remember that these days, even a baby will need his or her own individual passport and visa. Allow enough time to get one before you travel. And in some parts of the world immunisations are necessary – even for babies. Keep in mind that attitudes towards babies may vary from country to country. In continental Europe, for example, where children stay up a lot later, taking children into a restaurant late at night is acceptable. Breastfeeding in public, however, may be frowned upon in some countries, and you may want to bring a blanket or shawl to cover up.